Last Thursday, just seven miles east of Yellowstone National Park, researchers lured a huge male grizzly to a leg trap with an animal carcass. They drugged, collared and released him, apparently all according to well-established procedure. On their way out of the woods, though, they ran into a woman looking for her husband, teacher and botanist Erwin Frank Evert, 70, of Park Ridge, Ill. One researcher returned to the release site and found Evert’s mauled–but uneaten–body, according to the Billings Gazette. 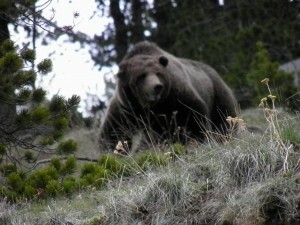 People have been blaming the bear, the victim and the researchers for the incident that is as mysterious as it is sad. Everyone is perplexed about why Evert went out there and why the bear attacked. When a bear doesn’t eat what it attacks, it’s regarded as defending itself, its cubs or its food. When grizzlies attack, though, it’s often to eat the person. “None of us understand it and apparently never will,” Chuck Neal, author of Grizzlies in the Mist, told the Gazette. Neal, whose book, reviewers say, highlights studying grizzlies without trapping or disturbing them, was also Evert’s friend. He says the botanist knew they were trying to trap a bear in the Kitty Creek drainage area and wanted to see the scene. The Interagency Grizzly Bear Study Team–an amalgam of the many wildlife agencies in the sprawling ecosystem that reaches out from Yellowstone Park–has been trapping, collaring and following grizzlies here since 1975 without anybody getting hurt by a sleepy bear. The agency follows protocols laid out in 1985 by Bonnie Blanchard, which call for using either leg-hold snares or culvert traps (which look like sewer pipes, baited with food) to capture bears. Researchers protocols typically call for the traps to be checked daily. Kurt Repanshek reported in the National Parks Traveler the biologists knocked out the mature, 430-pound bear with the drug Telezol. The mountainous, woody area was about two miles from the Evert cabin and Route 14/16/20/ that leads east out of Yellowstone to Cody. The complete timeline of events is unclear. The AP says Evert went out hiking at 12:45. (The Trib says 1:15.) Evert didn’t carry bear spray and went off the trail or forest service road to reach the area–two huge no-nos in grizzly bear country. Researchers at first wondered why they hadn’t run into him. It was also extremely windy–which would make it hard for the bear or the researchers to sense Evert. Even if he had bear spray, which sprays 30 feet, it would’ve been really hard to use. It’s two miles of rough, brushy terrain from his cabin to the site, but he could’ve been on top of the bear within an hour of its waking up. The Parks County Sheriff’s Office says they were notified at 6:48 p.m. The other question is when the bear researchers left the area and if they left a sizable carcass behind. The Chicago Tribune says the researchers lured the bare to the trap with a carcass. Since grizzlies are known to protect carcasses, did they remove it? Or are they supposed to leave it to feed a traumatized bear to make up for a lost day of feeding? I called the bear team but haven’t heard back. Biologists have captured thousands of bears this way and say they wake up passive and groggy, not aggressive. I asked Stephen Stringham, a grizzly bear biologist in Alaska and author of Alasksa Magnum Bear Safety Manual, who has had bears wake up in his arms and just walk away. So, why not wait with the bear to fully awaken, as biologists do with some other animals? Could something be off with this batch of drugs? Two mountain goats died just a week earlier after being darted in Glacier, prompting a halt to that study. A Glacier grizzly died the same way last year. Or is something off with the traps or trapping technique? The very next day after the Evert attack another grizzly bear died in a trap set by Old Faithful. (This one was the other kind, a culvert trap.) Sometimes even the best biologists can get things wrong, especially with an animal that reacts unpredictably. The capture and eventual euthanasia of the last U.S. jaguar, Macho B, in 2009 in Arizona prompted a criminal investigation and possible charges that biologists caused the death of the endangered species. The bear team did conscientiously make sure bear warning signs were up. The problem may be too many bear signs instead of not enough. I was there last week and nearly everywhere there was some sort of bear sign. I saw at least two grades–bear activity and area closed. But the area closed signs near Elephant Back trail were ambiguous; the trail was still open and a ranger lead a hike there. Maybe Yellowstone is becoming the park that cried bear? Why is Obama trying to gut the Endangered Species Act? 3 comments to Who is to Blame for Fatal Yellowstone Area Grizzly Attack? I thought that was extremeley intriguing. Thanks for the unusual facts. I’ll continue to keep next this….